We have a limited number of 2015 t-shirts left! 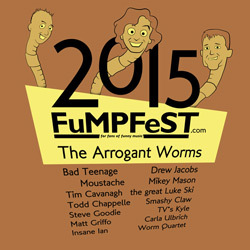 This t-shirt, printed for FuMPFest 2015, features the FuMPFest logo along with caricatures of The Arrogant Worms drawn by Devo Spice and a list of all the performing artists. All that's left is 1 large shirt and 1 XL shirt. Place your orders quickly if you want one.